Way back in June, I started a dialogue with Scion that led to the following information being provided by Graham Coker at Scion. This link takes you to a higher definition, PFD of the CEC map. “Biochar could potentially be a productivity boosting amendment for sites with low Cation Exchange Capacity (<10). For example sandy forest soils or leached clays (Podzols). 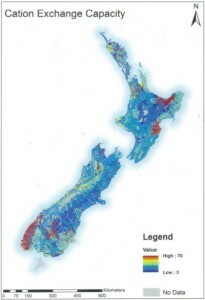 The attached image indicates the national distribution of CEC across NZ. Note that only a fraction of these sites are plantation forests. Incorporation within the soil 0-10cm is desirable but is it critically necessary? Benefit may be gained from combination of biochar within the addition of other site limiting nutrients to correct nutrient balance, perhaps these other nutrients are best foliar applied and then as they are return to the litter layer through loss of needle retention, can be re-captured by the biochar? The map was produced from publicly available data (Fundamental Soils Layer). Source: Landcare https://lris.scinfo.org.nz/layer/99Might be appreciated if you do something along the lines of-fsl-cation-exchange-capacity/ , mapped by Scion.